How to fix a cracked tooth. That pain that you feel when you bite in to something can be a cracked tooth. Sometimes its hard to reproduce the symptom and it happens only on occasion. That is still serious though and it will likely need treatment. 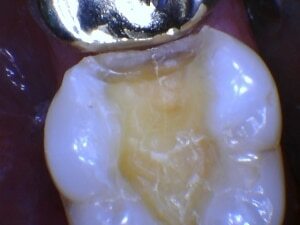 When a tooth has a deep crack into the inner part, or dentin, of the tooth then usually the only predictable treatment will be a crown. With a severe cracked tooth, even a bonded white filling is not enough to prevent the crack from getting worse. If left untreated, a cracked tooth could lead to needing a root canal or even tooth loss. Here in my Victoria Dental Office, I often see these in patients who didnt even know that they were there. Its important to get regular checkups for that reason and to have it checked if you are having symptoms because further damage can be prevented. As you can see in the photos above, not only did the tooth crack, but the white composite filling cracked too in the same exact spot. 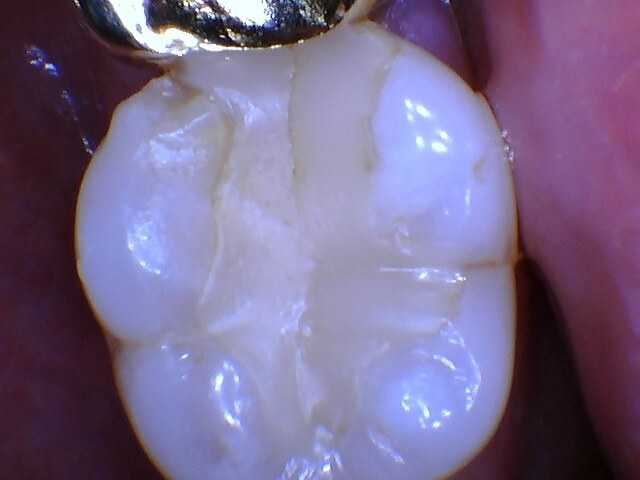 This is why for a severe crack, a full crown is the only predictable way to protect the tooth.